I watch all kinds of bizarre shows on television. I think it was Dr. Phil (before he became all weird on his own show) said men flipped through channels at a rapid pace looking for something to interest them. Women are already interested in what’s on television or we wouldn’t have it on in the first place and only flip through channels to find what is the most interesting to us. I couldn’t agree more. My husband will watch any old thing on television but I look for the show that is the most likely to rock my brain. And Friday night, such a show was called “Mysteries at the Museum.” Lesia, my cofounder, HATES that show. Can’t recall why but she does. I think it has some really great moments and pieces of interesting history, and Friday it was Lady Wonder, the Psychic Horse. Now, I know you’re probably thinking to yourself, “Jennifer. You just had an entire blog about how you had serious disbelief in most psychics.” And you are correct. But I think we can all agree that (psychic) people and (psychic) animals are worlds apart. First, you can’t prompt animals in the same manner you could with people. You can’t tell your dog that the lady in red is hoping to reach her dead grandmother and have good old Fido understand what all that means (color-blindness aside) in order to trick her into believing Fido is psychic. Animals don’t have the awesome power of deduction we do. We can look at someone, their surroundings, their life and make certain deductions (and some of you even make assumptions). The most spot-on example of this is the episode of South Park which, in my opinion, single-handedly got John Edwards’ show cancelled. Stan, the kid with the blue and red hat, decides that Edwards is a fraud and confronts him about Stan’s hunch. Edwards flips out and Stan decides to steal Edwards many books on how to fake being a psychic medium. Stan reviews the books and puts his new found powers of deduction to work. His newfound ability to deduce ends up getting him his own show with better ratings than Edwards. Stan has a psychic a showdown with Edwards in which he makes a valid point: friends and family have better options in the afterlife than to find John Edwards and have him relay messages although such a notion is comforting to those left behind. Quick side note on the difference between deductions and assumptions because I know it can be a grey area for many people. Deductions are conclusions reached after examining available pieces of information whereas assumptions are conclusions drawn on irrational, flawed, or even no logic. I found a fantastic example online. You are in the grocery store, and in your cart are two boxes of cat food, a tin of tuna, a bag of cat litter, a single-serving frozen lasagna, a mega-size bar of chocolate, a box of tampons, and a bottle of Jack Daniels. Deduction: You have a cat. Yes, it’s quite possible you are picking up the cat items for a friend or your mother, but the tin of tuna suggests that you love the cat. Your “I love my cat” canvas carrier bag reinforces the deduction. Assumption: You live alone, and you have your period. It may or may not be true, but there is no value-judgment or tangent here. Offensive assumption: You are a miserable, hormonal, single alcoholic. Back to my soapbox. So we see people, we make deductions (or assumptions), and some people use such information to their own personal gains (shady psychics, grifters, fortune tellers, and the like) and claim to be psychic. And while I agree with the notion that friends and family do have better opportunities to spend the after- life than hunting down someone to relay the message that “Grandma’s fine,” I will acknowledge that’s not always the case. It seems to me that every now and again, a message more pertinent needs to be said and that’s why I do what I do: investigate to help relay a potentially pertinent message. A horse cannot deduce, but in this case she was able to relay a very important piece of information: the location of a missing boy from Massachusetts. I’d also like to address a potential problem that many accused Lady Wonder’s of: telling her horse the answers. 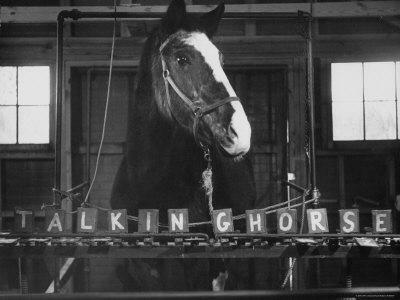 This possibility was eliminated when Dr. J.B. Rhine (Rhine Research Center) came to test the horse. The horse was blindfolded with blinders and her owner was out of sight. Further, I have no idea how a woman in Virginia would know where the body of a young boy in Massachusetts would be found or be able to predict other such things like a boxing match or where oil lays with accuracy. We can all guess, but Ms. Fonda, the owner, would have also have to be psychic to be that correct that often and if it was Ms. Fonda, then why say it’s the horse with the gift? I suppose money would be the answer to that question, as it is to most questions. A psychic horse is much more interesting than a psychic person. At any rate, Dr. Rhine has been associated with claiming at least two frauds as genuine and so his integrity and reputation are not be relied upon with any great force. That said, another gentleman went to see if he could debunk Lady Wonder and claims that he did. Professor John Scarne said that the only time Lady Wonder would answer him is if Ms. Fonda knew the question. Professor Scarne noticed Ms. Fonda carried a small whip in her right hand, and she cued the horse by waving it. He noticed Ms. Fonda doing it every time the horse moved the lettered blocks with her nose. Being a smart guy the professor knew that horses have eyes on the either side of their heads and therefor have amazing peripheral vision so Lady Wonder could see her owner even when Ms. Fonda was nearly behind the horse. The always incredibly skeptical James Randi also believes this entire shindig to be a fake (shocking). A magician also looked into Lady Wonder and decided it wasn’t fake, the reason the horse couldn’t answer properly when Ms. Fonda was absent was because ideometer was occurring. This frequently occurs in the use of Ouija boards, when a person unconsciously makes movements to comply with a request or get an answer that they then attribute to the supernatural. This entire thing leaves me with burning questions. How does a horse get so many questions right, too many to be coincidence? If it isn’t the horse, why didn’t Ms. Fonda continue with the psychic thing to her own monetary benefit?